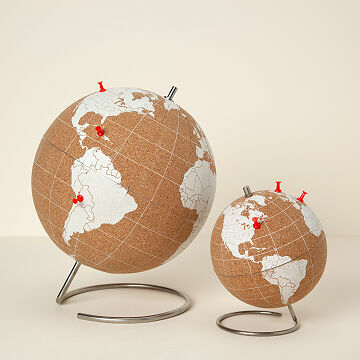 Track your travels in three-dimensional style with this colorfully detailed cork globe. Spin through memories of your past journeys and plot future adventures in three-dimensional style with this colorfully detailed cork globe. Use the five red pushpins to mark the spots you cherish most, or even attach pictures, tickets, and mementos to relive the thrill of your trip all over again. Bringing a modern touch to your library or office, this personalized keepsake lets you celebrate the beauty beyond your backyard with every turn. Made in China. I bought this for the upcoming Father's Day. I think my husband will really enjoy pinning all of the places we've traveled with each other and our children. Seems sturdy, rotates well, and is a pretty piece of art for his office or our living room. We were very surprised by the poor quality of the globe. Great idea, poor execution. A very thin layer of cork, which was peeling, around cheap cardboard. I would not even attempt to put in the push pins for fear of it collapsing in. It looks lovely on the website, but looks are often deceiving. And add this all to the price (large globe), and our feeling is that it should be removed from the website. We are very disappointed, especially with your background and purpose. After a satisfying conversation with customer service, we are in the process of returning it. Hopefully future orders will turn out well. We purchased multi colored map pins in lieu of giving the included pins which are very cheap. Looks great and sturdy. Hope it holds up to its first impression.